SPAIN - At the beginning of the year, market prices for hogs were below 1 euro/kg liveweight. However, after 20 weeks of consistent price rises, the current price of 1.325 euro/kg liveweight has been maintained (with small ups and downs). A year ago, this price was 1.185 euro/kg liveweight. The average carcass weight of pigs is 1.5 kilos lower than last year. At the end of this summer, pigs have lost more weight than in previous years. The pig population has dropped 1.8 per cent among the Top 12 EU Producers, and the demand is higher. Germany’s pig population dropped 3.4 per cent (current population 27,146,000 with 1,917,000 sows), as well as Denmark’s (-2.6 per cent, total 12,313,000 pigs left), the Netherlands (-1.7 per cent, total 12,388,000 pigs left), and Poland (-12 per cent, total 10,239,000 pigs left). On the other hand, Spain has increased its numbers, with 2.1 per cent more pigs (+558,000 heads, 27,541,000 total). While the number of sows fell by 1.5 per cent compared to the January census, there has also been a 6 per cent increase in piglets due to better sow production. If you compare the total Spanish herd numbers with Germany’s using data from EUROSTAR (May 2016), we can see that Spain produced 400,000 more hogs and remains in first position in the EU. However, Spain and Germany currently have the same number of hogs, due to the imports Germany has made for slaughter. According to MAGRAMA, the first half of 2016 saw 24,328,694 pigs processed, representing an increase of 6 per cent over the same period in 2015 (22,952,203 hogs). This resulted in the production of 2,091,883 tons of pork, representing an increase of 7.2 per cent over the same period in 2015 (1,951,900 tons). Fewer pigs makes it harder to satisfy the high demand in the market. However the price of pork is set and cannot rise. In addition, due to the change in weather (and the subsequent influence on the growth of animals), there will be more hogs and more weight. The market is in a significant different position when compared to earlier in the year. Back then, Germany was the #1 producer for both live animals and pork, and was the leader of the EU. Germany was freezing pork because there was no suitable market for the product. Most of the production was completed in Pietrain, and the selling price of live animals was below the cost of production. Nine months later, Spain is now leading production of hogs due to its lower cost of production. Germany remains the largest processor, taking on animals from the Netherlands and Denmark. Cold stores are now empty, and unable to fill up due to the price of live hogs. More than 80 per cent of produced hogs are descendants of Pietran. Spain is currently exporting to Asia. This has changed the market, as producers are now looking for animals that produces pork that is competitive in terms of quality, both for exportation and domestic consumption. The Spanish market is becoming increasingly dominated by the largest integrators, who are maintaining current production while also taking on new short to medium term projects. Spain continues to grow in its total production of pigs while also undergoing an expansion in its meat industry. As for exports, over 60 per cent of pigs exported by the EU in the first six months of 2016 has gone to China, with Spain leading the way. The current price of pork in Italy is very good for farmers. 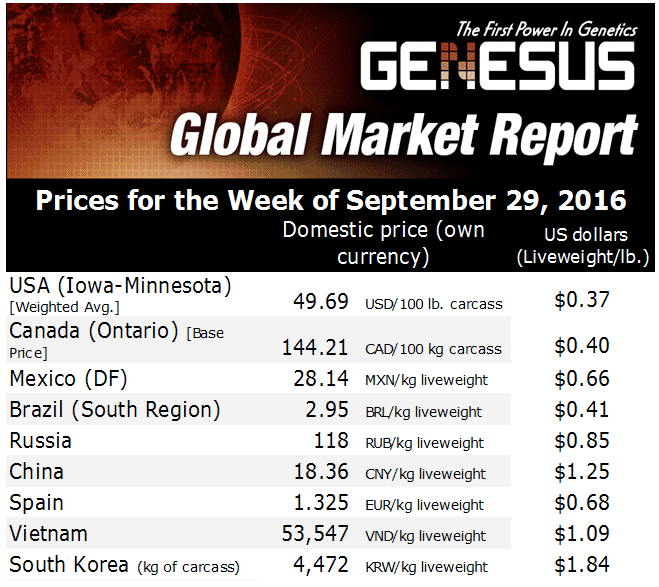 This week, the price has gone up definitively (+3 cents in Modena, 1.714 € for weights of 156-176 kilos). This means that the market has yet to be corrected by supply and demand. There are just not enough pigs right now, and weights have been down every week (last week, -700 gr to 168.600 kilos). On the other hand, demand is normal for this time of the year, but is still too much for the limited supply of live pigs on the market.